January 24, 2019 – At this year’s IDEA Show in Miami, FL, Sandler AG invites visitors to the garden of (green) developments. 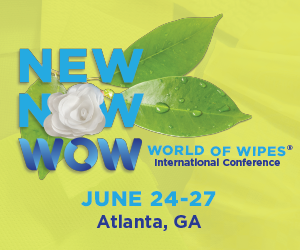 The nonwovens manufacturer will showcase its broad range for hygiene products, wipes, and technical applications, among them nonwovens that take account of sustainability. Made from a special, certified viscose fibre, Sandler’s new substrates are biodegradable and also available as FSC® certified variants. They offer the established Sandler quality—highly absorbent, tear-resistant and better for the environment. The PEFC™-certified substrate „bio textile by sandler®“ is made exclusively from viscose fibres sourced from European forests—sustainable raw materials with a reduced carbon footprint. Newly developed nonwovens made from viscose and cellulose acetate fibres are soft and gentle on the skin. They are biodegradable and compostable. Wipes substrates made from the lactic-acid based raw material PLA and product variants with a share of cotton complete the range of nonwoven substrates made with raw materials from renewable sources. An embossing design dubbed „square“ further enhances cleaning properties. Rows of small squares enlarge the nonwoven’s surface for optimised dirt removal while also rendering the wipe substrate more voluminous for a softer, fluffier feel.